At National Geographic Learning, we know that teachers and learners are turning more and more to technology as a tool for learning in and out of the classroom. That's why we provide solutions to all of your technology needs. 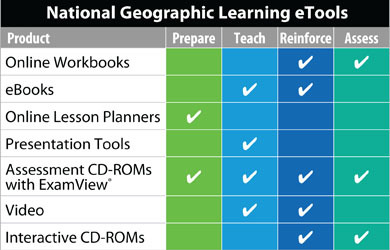 We have web-based tools, eBooks, and other software for every part of the teaching and learning process. Our technology resources help take the guesswork out of preparation, teaching, reinforcement, and assessment so that you can do what you do best: help your students succeed. For more information and a demonstration, please contact your local National Geographic Learning Consultant. Teach with a wide array of technology for the classroom, designed to keep your students engaged and motivated. National Geographic Learning has everything you need to create an exceptional learning environment and carry out assessment. 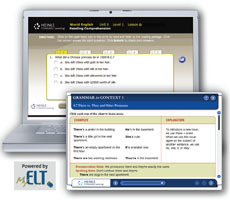 Available with our best-selling National Geographic Learning programs, Assessment CD-ROMs with ExamView® test-generating software allow teachers to create and customize tests, quickly and easily. 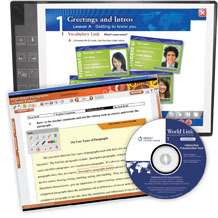 Available for our best-selling series, and available on CD-ROM, Presentation Tools combine resources and activities for use in the classroom, with an interactive whiteboard or data projector with computer. 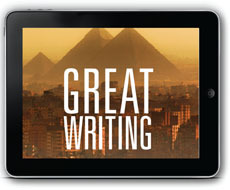 Experience the sights and sounds of National Geographic Learning and boost your language skills through National Geographic Learning technology tools, including Online Workbooks and Online Video Workbooks, eBooks, mobile applications, and more. Available for most of our best-selling programs, Online Workbooks and Online Video Workbooks feature interactive, automatically-graded activities, including video and audio that learners use in or out of the classroom. 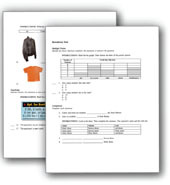 Teachers can generate reports for individual learners or an entire class. Powered by VitalSource Bookshelf®, our eBooks give learners fully integrated online, downloadable, and mobile access to their programs, allowing them to work on a laptop, in the library, or on a smartphone. 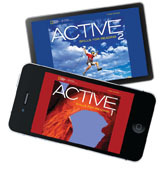 Access definitions, examples, and pronunciation support quickly and easily with National Geographic Learning mobile applications, included with each print dictionary.